I am ridiculously far behind on my blogging again, but instead of waiting to catch up to the present, I just had to blog some things I've been thinking about and that have been going on. 1. Mom and Dad Rogers called on Wednesday and said, "We heard you're moving in this weekend, so we are driving down to help!" I thought that was sure thoughtful, but had NO IDEA how absolutely amazing their help would be, or how absolutely helpless we would have been without them. They are seriously so so thoughtful. I love them so much, and love how they make what's important to us, important to them! Not only was dad Rogers like Super Man during the move, he helped Dave put together EVERY. SINGLE. THING that needed to be put together, and put them in the right place! So by the time they left, we had a lovely set up sitting room, a put together kitchen table, chairs and hutch, and almost every kitchen box unpacked, AND Jaxon's loft bed put together. It would probably all still be undone if they weren't here to WORK WORK WORK!!! 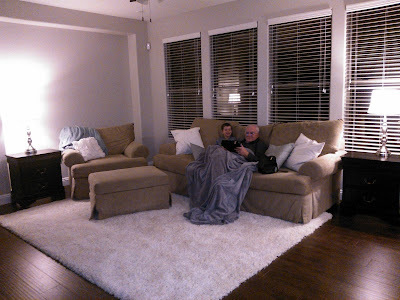 Jax and Gpa in the new TV room! 2. It rained pretty much non-stop all weekend. Like, to the point that there was no way to move our stuff out of the mobile mini and into the house in the down pour. (this is NOT the miracle!) The new ward was all set to help us at 8am on Saturday but it couldn't happen- raining cats and dogs. We grocery shopped, and headed to Costco. On the way out (around noon) it was still gray skies but no rain! We called the EQP and asked if he could get some guys to help us move in as much as possible before the rain started back up. 3 people came over, and between them, Dad and Dave, and me and Mom, we hauled our rears! Every time it would start getting a little misty I would say a prayer in my head to PLEASE PLEASE PLEASE let us clear out the mobile mini before it started again. Sure enough, and the guys were carrying our LAST item- our couch, through the front door, it started to POUR! P.O.U.R! It was such a tender mercy that I absolutely DO NOT chalk up to coincidence. Heavenly Father heard my prayers. 3. Jaxon and Cooper were both pretty sick. (Also NOT the miracle!) And when we woke up and tried to leave G and G Ferrell's to head to the new house, Jaxon was beside himself. He was cold, tired, and not feeling well. Heading to a place with no furniture, TV, or toys unpacked was NOT high on his list. Grandpa Ferrell came downstairs just in the nick of time and heard Jaxon's pleas to please not have to go. G Ferrell said Jaxon could stay with him for a few hours and then he would bring him over. A few hours later they popped by so Jaxon could say hi, but they were just passing through on the way to pick up the cousins to play. A few hours later he popped in again, but this time just passing through to get a treat. A few hours later G called and said, just let Jaxon stay here and sleep tonight! It was so so sweet, but Jaxon did want to go to pizza for dinner with us! Jaxon stayed with Grandpa from 7am till 5pm that day, and as a result had a very special time, and we got SO MUCH DONE while NOT trying to entertain a very bored and slightly sick 6 year old. If you want to know the truth, I think Grandpa Ferrell is going to miss Jaxon as much as Jaxon misses Grandpa. They are absolutely best friends. It's one of the most beautiful things to me, and as mother, it is priceless. The next thoughts I have are how much I am enjoying my roll as full time mother here at the new house. At G and G's, we were absolutely spoiled. SPOILED ROTTEN! It was wonderful, and during the first 3 months when Cooper was tiny, not sleeping through the night, and my postpartum was in full effect, it was a blessing straight from heaven. My mother is a saint for all that she did to try to ease my burdens. 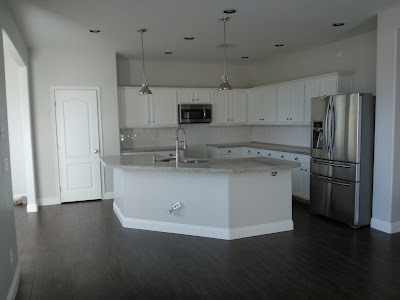 Now that we are in the new house, I am actually really enjoying, the cooking, cleaning, chauffering, and being the boss. It warms my heart to have a house that I love to clean. I am so completely exhausted. It has been a looooong 6 months of NOT doing any of these things, and at night I fall into bed exhausted, but so grateful. Emily and I have been going to the gym together at 5am...yes, that's AM!! It's so nice to be accountable and have to pick someone up so I have to go. Because, except for the 15 minutes between 4:45 and 5am when I am awake in the cold, dark, house and everyone else is slumbering warmly and peacefully, I am SO glad I went! Which brings me to one of the greatest miracles of the new house- COUSINS!! Jaxon has played with the girls everyday this week, and I absolutely love having my house full of LOVE! I love the giggles, the sneaking snacks from the fridge, the playing, and I love that Jaxon is building friendships that will NEVER fade. I'm sure the novelty will wear off and it won't always be a daily thing, but for now, I love this lovely noise. I am exhausted. There is still so much to do, unpack, and get settled. And I could not be more grateful. I love this work called "family".